I saw a bee yesterday; proof were it needed that ﬂowers are important at this time of year, not just for our enjoyment, but for our pollinators, because if bees are active, they need ﬂowers to sustain them. Here in rural Norfolk, the chives are still ﬂowering as if it’s summer, as are the delphiniums and geraniums. New blooms are opening on roses and mingling with plump glossy red hips. Winter is taking its time to arrive; it clearly hasn’t read the barrage of reports screaming that next week our gardens will be at the mercy of plummeting temperatures, snow and ice. One of the surprises in the borders has been the tardiness of certain plants to come into ﬂower. 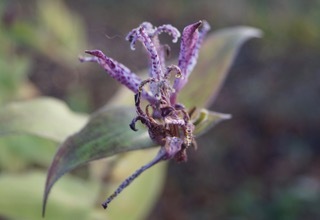 Tricyrtis hirta ‘Taiwan Atrianne’ looks a bit ragged, as if it’s turned up to a party late and rather the worse for wear. In truth, many of the perennials look as if they’ve stayed at the party a little too long; despite this, I appreciate their presence, and the colour they bring to the borders in late autumn. I had anticipated that the ﬂowers of Ageratina altissima ‘Chocolate’ would grace our garden somewhat earlier than November, but better late than never. They shine brightly in the lowering light of late autumn, and are all the more treasured for this. They are reputed to be beloved of butterﬂies and bees, but their late arrival means that they have missed the butterﬂies this year. Nevertheless, they stand waiting for bees. 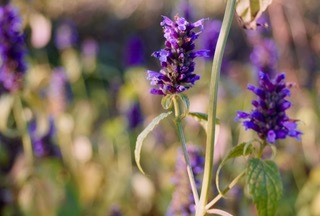 Agastache ‘Blackadder’ is still blooming. Agastache is hardy here, and seeds itself gently around. The leaves are deliciously aromatic, and their fragrance as I brush against them when working in the borders is always welcome. Do Echinops ever give up? 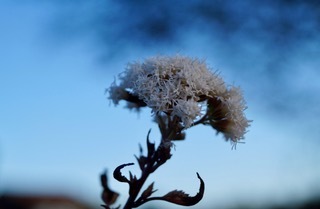 There are new ﬂower heads forming still, and they seem incapable of looking tired. They certainly win the prize for the freshest looking summer ﬂowering perennials in our November borders. A garden in the next village has primroses in ﬂower already. Here, Aubrieta is out of the spring starting blocks early. Meanwhile I am seeing more birds in the garden, particularly a posse of marauding ﬁnches swooping down onto seedheads. I leave leaves on the borders and stems on herbaceous perennials to provide shelter for creatures. 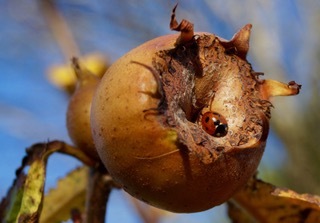 I don’t take all the apples and crab apples as I prefer to share them with wildlife, and while picking medlars, I discovered them being used by ladybirds, so I left some for them, although doubtless the birds will take the medlars before very long. The hedgerows are rich with fruit, and I have never seen the espalier Pyracantha that clads our garden walls so laden with berries. It is as if the larder is full, and ready to support our wildlife through the winter. Let us hope it is a kind one! 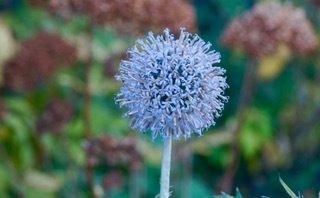 This post will be linked to Garden Bloggers’ Bloom Day hosted by https:// www.maydreamsgardens.com . There you can discover what is blooming in gardens around the planet this week. 3 Comments To "On the Menu for ...November 2018"